Toledo neurologist Dr. Ted Barber said his recently published book The Doctor’s Stories is not a memoir, but instead is a collection of short stories — tales of memorable patients and experiences that have shaped his career and his medical philosophy. 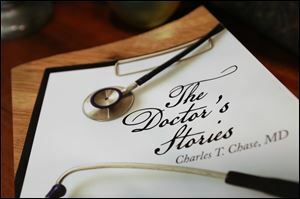 The 60-year-old former chief of staff of Mercy St. Anne hospital, published under a different name, Charles T. Chase, MD, and all the characters names in the book are also pseudonyms, to protect the privacy of patients he has treated over the past 30 years. Dr. Barber, a native of Wauseon, who joined the neurology practice at Toledo Clinic in 1990 said the book contains some 30 individual stories and the chapters are in no particular order. They were taken from a journal he kept over his career as a physician. It started with about 100 stories captured in his journal that were then narrowed down. His favorite chapter in the anthology is a sweet love story featuring an elderly couple struggling to maintain a connection as Alzheimer’s disease threatens to erase their ability to communicate with each other. In the chapter titled “Dance the Night Away,” Dr. Barber chronicles how the characters Jerry and Sophie Bykofsky, both in their 70s, came to him for help while she was still in the early stages of the disease. said. She just smiled most of the time, unaware of her circumstance, while her husband, like so many other men caring for wives with this disease, struggled to remain strong, he said. “Sophie, still retained much of her youth and beauty. Her skin was hardly wrinkled at all, and you would have thought she was much younger than 75,” he wrote in the book. Dr. Barber shared how Mr. Bykofsky would use their checkups not only for medical advice but also as a chance to lament his loss. He was longing for the wife he use to know. “Then he would start to get sad and tell me about the person he used to know, the woman who loved to cook and sew, and kept her house as neat as the uniform of a queen’s guardsman,” he wrote. One day, however, during a visit Dr. Barber could tell something was different because they were both smiling as Mr. Bykofsky shared some news. One Sunday after the couple went to church and then dinner. They got home and instead of watching television, their usual routine, Mr. Bykofsky asked if he should put on the radio and she nodded yes. He turned on WSPD to an all Polka request show. Sophie held out her hands and opened her arms indicating she wanted to dance and began to swing and sway to the music. “So ever since that night, after supper an’ we cleared away an’ cleaned up our supper, we push the table against the wall, an’ I put on some records an’ we dance, Doc. Sophie never seems to get tired,” he wrote. Mr. Bykofsky cried tears of joy while telling the story to Dr. Barber. This character and all the others in the book have stuck with the physician over the years because he learned something from them, he said. “I would see about 600 patients in a month and I might remember or write down about a dozen of them. These people were the people that there was something different, there was something that stood out — there was something that was off kilter and just out of the ordinary,” he said. A Wauseon native, Dr. Barber is a general neurologist with both Mercy St. Anne Hospital and ProMedica Toledo Hospital. The book is not all melancholy. There is also the story of a patient who makes Dr. Barber smile. He lovingly recalls a woman who had numerous medical problems and was in and out of the Air Force hospital where he completed his residency in San Antonio. Carrie had dementia and cursed like a sailor and one day she hurled a plate of spaghetti at an arrogant, immaculately dressed doctor who tolerated the hospital patients as “necessary evils,” he wrote. From Carrie, Dr. Barber said he learned patience. “Because if you’re going to challenge a demented person your job is gonna get 10 times harder. You have to go with the flow — kill them with kindness,” he said. Then there was the grizzled, 58-year-old man dressed like a biker whom to this day he still respects. Dr. Barber watched the patient take a massive shock to the heart delivered by a defibrillator, without taking any sedatives. The man, who listed his occupation as a social worker, was diagnosed with atrial fibrillation, an irregular and often rapid heart rate that commonly causes poor blood flow to the body. The ER doctors wanted to give him an electrical shock to the heart to reset the rhythm or control his heart rate. He was a recovering addict, however, and didn't want to risk having any drugs in his body. The shock can feel like a sledgehammer across the chest but the patient refused any drugs to help him relax, he said. After receiving the highest voltage the defibrillator could deliver, he sat straight up and proceeded to go on a rampage, throwing things around the examination room, Dr. Barber said. Despite the destruction to the room, those who witnessed it “thought there should be a monument erected or at least a plaque placed on the wall in the exam room in the emergency department,” where Robespierre Willard Shenk took a 300-joule counter-shock while fully awake and aware, he wrote. Dr. Barber is a graduate of Bowling Green State University and the Medical College of Ohio. He said writing this book also gave him the opportunity to talk about how practicing medicine has changed in the last 25 years. He has been through a malpractice lawsuit and is very concerned about how much power insurance companies and the government have over how doctors treat their patients. “It’s getting really crowded in the exam room with CMS, other government agencies, insurers, ombudsmen, and hospitals,” Dr. Barber said. His book is available on Amazon, Barnes & Noble, Google Books, and Xlibris.